So the ABs are in town this week for the game on Saturday. I hope the Argentines get the same reception. They deserve it too. Not your greatest photo Richie. 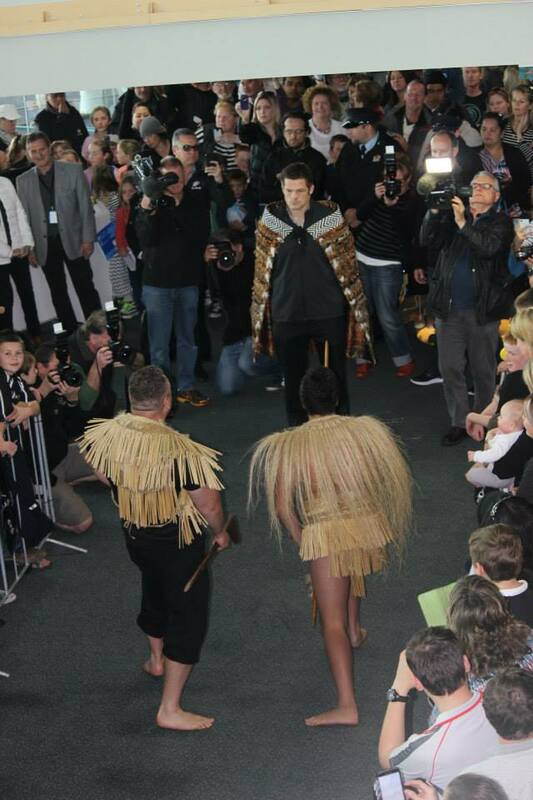 Rocking a korowai at the welcoming. He really would make a great addition to my Maori whanau. I'm not their biggest fan, I'm in it for the sport. Still got jealous when Tyler's Mum posted this on her Facebook boldly stating she was the FA on their flight into Napier. I decided I'm going to watch the game at home. I saw the seating assignments on the tickets and it's not worth it .. besides, I hate crowds. Images from the HB Magpies and Kiri's iPhone. Only one way to explain tonight .. and it wasn't just our ward. I have video footage, but when I get over the initial shock of the whole thing being such a fricken circus, popcorn and all, then I'll upload something. Yep. I overdid this. Spent money that I didn't have. Bought things that I couldn't afford. Dropped items into my Mums shopping cart secretly this week and went full on overboard, but you know what? She's 4 years old. She's going to appreciate this birthday more than she will a teenage one and she's going to remember this birthday because she appreciated it. Everyone told me to save it till she was 5, but children don't need a big birthday to introduce them to the next 14 years of progressively concentrated schooling. When Ngawi turned 5, he was worried about school. The pirate cake didn't do diddly, he was concerned about starting school the next week. Despite homeschooling, I have to give her a year of appreciated grace before she falls into a new and tougher course ware. It was a long day. My family are great. Loved the part where the two big boys got owned by Nan for being a-holes all day, but the best part was everyone and everything. We opened them at home just she and I. It's not tradition, but I wanted to see her eyes light up every time she opened one without the aid of other kids. This ish needs to be controlled. It's not just about ripping paper, seeing what you got and pushing it aside for the next surprise. No. I explained who gave them, what they did before she moved on to the next one. Everyone scribbled notes to Hubba at the table. Great idea. Big thanks to Aunty Tashi who was very meticulous about it. It was delicious and looked fantastic. It was a team effort and came together nicely. No wind or rain all day, but as I sit here typing this ... I can hear rain on my rooftop. Brother 1 left to go back to Australia tonight. "Thank you for my birthday. I loved it". She really is everyones favorite.